On this episode Taylor Pearson joins Jordan and Brian to discuss the changing world…from traditional jobs to entrepreneurship. Taylor began as an interpreter and English teacher and transitioned to an entrepreneur and marketing consultant. He talks about his upcoming book, The End of Jobs, which he hopes will help people take the steps to become an entrepreneur. The guys discuss how technology and the internet have changed the traditional safe types of jobs due to companies turning over faster and faster. Through time what was once considered a safe job is no longer the case. The changes have enabled entrepreneurs who make smart financial decisions to gain greater control. Taylor demonstrates how safe jobs are like “the turkey problem” which is a dilemma faced by holiday gobblers each year. Taylor explains how apprenticeships with entrepreneurs and stair-stepping with low-risk micro businesses can lead to success. Check out Taylor’s website to learn more about the soon-to-be-released book and stay tuned to his site for some upcoming book giveaways. If you opt-in on Taylor’s book page you’ll get a free copy when it comes out. Taylor will be hanging out in the comments below and will let us know when the giveaway for $1310 of books goes live. Today’s episode was sponsored by PodcastMotor. The concierge podcast editing service which does does everything from editing your show to publishing it on all major podcast networks. 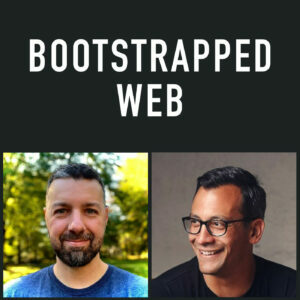 Bootstrapped Web uses PodcastMotor and highly recommends it if you’re serious about your podcast. Mention Bootstrapped Web when you sign up to get 2 free episodes of the Concierge Service. Thanks for having me on gentlemen. Had a great time chatting with you.